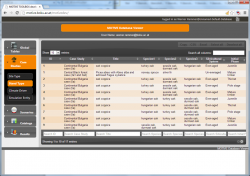 The database viewer is a tool that lets you explore the data content stored in the database. These data elements are the results of forest simulations (both state and fluxes over time). Moreover, the meta data in the DataBase can be viewed. Meta data is information about site and stand types, climate characteristics and so on. 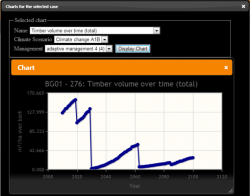 In addition to basic viewing some export and charting functionalities are included. The DATABASE VIEWER is a web based user interface for the pure data base content stored in the DataBase. General data in the data base (i.e., data from forest model simulations and meta data) is stored using the MOTIVE harmonized model output. More details can be found in the wiki http://motive.corporate-wiki.net/index.php/Harmonized_model_output.The DATABASE VIEWER cannot be used to add or modify data in the DataBase. A related tool is the MOTIVE Client, which is responsible to add data to the DataBase. Data on simulated forest state and flows can be viewed (and exported). 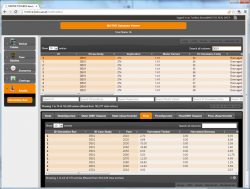 The meta data (e.g., site types, stand types) can be accessed. Database contents can be visualized (selected simulated quantities).